In Rendsburg station you take the Regionalbahn (RB) in direction to Husum. You have to change in Husum. From there you take the RB in diretion to St. Peter-Ording and leave the train at the station Tönning. Anfd then it's just few minutes walking. You start in Rendsburg and take the B203 (national highway). Then change to the B5 in direction to St. Peter-Ording/Husum/Tönning. The extension of the B5 is the B202. Follow the signs to Tönning/ St. Peter-Ording. The Schleswig- Holstein Wadden Sea is the largest national park in Germany. It belongs to the UNESCO World Heritage. Nature can still develop for the most part without human influences. The food-rich tidal flats are a stopover for many species of birds. The Wadden Sea is the richest area of birds in Central Europe. Over 2 million birds pass through the Schleswig- Holstein Wadden Sea and about 100.000 pairs are breeding in the national park. All in all over 3.200 Species of animals are living in the national park. A specialty is that about two-thirds of the area of the park are under water and the mainland consits mostly of salt meadows and dunes. Very recommendable are the guided tidal flat tours. Alltogether they offer over 10.000 trips, tidal flat tours and boat tours with wildlife watching and analog activities. For all who want to use a bicycle, they have special strechtings, where you can ride bikes. Multimar forum is the most important information center about the National Park. There are over 200.000 visitors annually. It's an exhibition to the tidal flat, whales and world natural heritage with numerous aquariums. It offers unique experiences and impressions. The National Park offers excursions with ships, which makes it possible to watch seals very closely. You can observe them in the natural environment. This hotel offers free Wi-Fi and free parking, a 5-minute walk from the harbour. 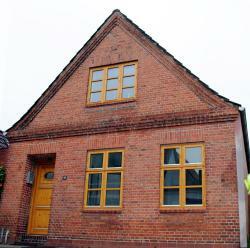 It features a pretty garden, and is a few steps from Tönning Train Station. The modern rooms at the Hotel Miramar include a safe and satellite TV. Quietly located in the fishing village of Tönning, Buttjehuus offers a large furnished terrace with garden and free WiFi. The picturesque Eider Harbour is just a 2-minute walk away. Offering classical-style rooms with free Wi-Fi, a garden, and a traditional Frisian café, this 3-star hotel lies opposite the Tönning harbour, on the North Sea peninsula of Eiderstedt.